This recently built wooden junk is designed in traditional style, but with contemporary, luxurious cabins and facilities. The Boutique boasts a rooftop sundeck, 2 decks, and 15 beautifully appointed cabins – the perfect way to experience the natural beauty and spectacular seascape of this UNESCO World Heritage site! 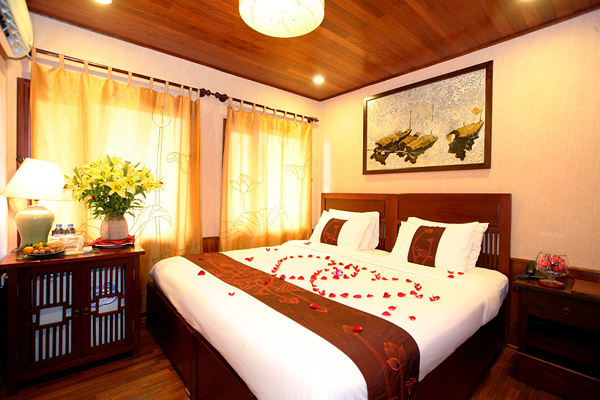 Each of the Boutique’s cabins is furnished with wooden décor and has picture windows overlooking the seascape. All of the cabins have an in-suite, luxury bathroom fitted with massage shower, deluxe toiletries, hairdryer, bathrobe and slippers. Every cabin is also fitted with a telephone, minibar and safe. The Boutique’s restaurant provides a comfortable and romantic setting, with large panoramic windows with views of the bay, while enjoying Vietnamese cuisine at its best. 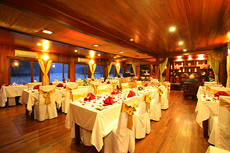 Its experienced chefs provide a varied selection of local as well as international cuisine, including fresh local seafood. The bar and sundeck both offer daily happy hour, movie nights, and board games. 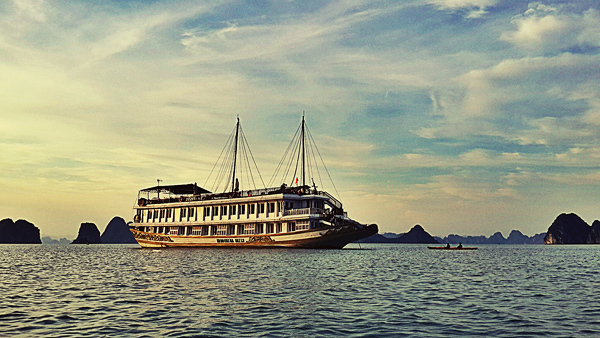 The ship also offers activities such as kayaking and night fishing, and passengers can participate in a T’ai Chi class or a cooking class. Download the Indochina Sails Boutique ship layout to see specifications of various cabin classes and deck plans.